A skin peel and microneedling treatment that is quick, virtually pain free and with minimal downtime? It exists and it’s here at Dr Giorgia Ratta Cosmetic Clinic in London! 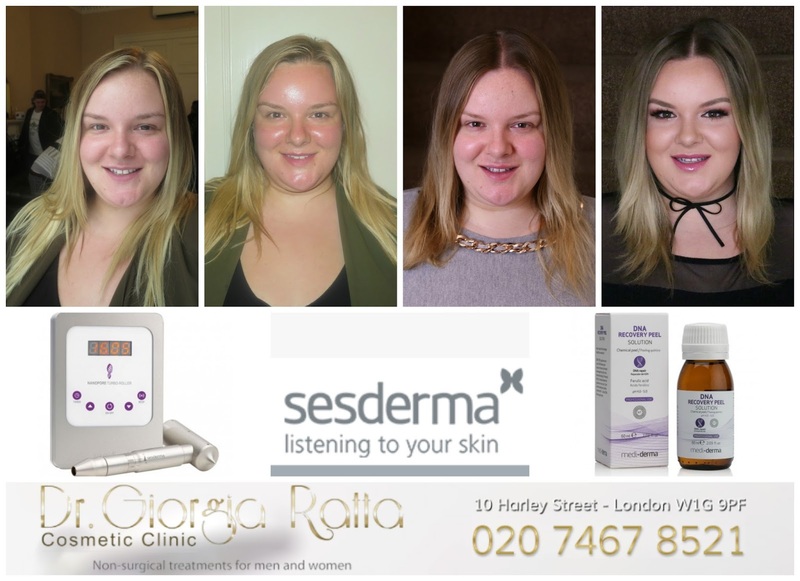 At the end of September, I headed to the Dr Ratta’s clinic on Harley Street in London for what would turn out to be be the best skin treatment I have ever had; the Sesderma DNA Recovery Peel with Nanopore Stylus and Mesotherapy. 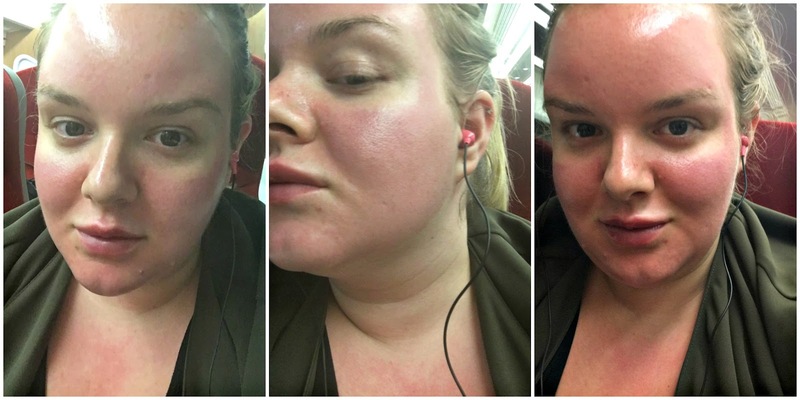 Over the last six weeks, I have been tracking and recording my progress following the treatment so that I could report back my findings to you all and an accurate report on my skin before and after the Sesderma treatment. This is going to be a long, detailed post so grab yourselves a cuppa and buckle up for the ride! Sesderma are a skincare company founded almost 30 years ago in Spain by Dr Serrano and a team of dermatological and pharmaceutical specialists. 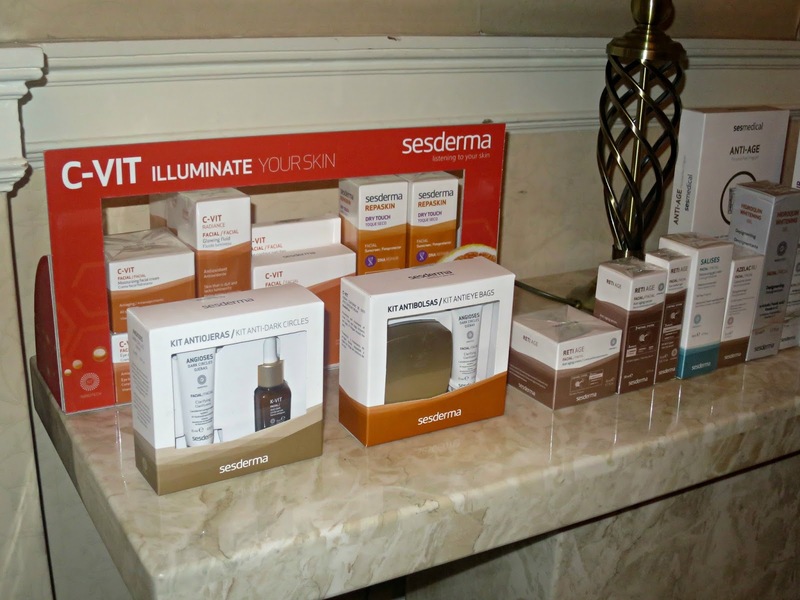 They have recently launched their range of pre and home care beauty products for the skin in the UK as well as their Mediderma range for medical practitioners to use in cosmetic clinics. Having a range of treatments and procedures that can only be administered by a qualified doctor or nurse instantly elevates them into the more exclusive beauty world. These aren’t just treatments that make your skin feel nice; they’re proven to work with visible, long lasting results which makes them a cut above the rest. The treatment that I had was the Sesderma DNA Recovery Peel and Nanopore Microneedling treatment which is two separate procedures delivered one after the other as a high performing facial by Dr Ratta. It works to resurface, repair and protect the skin and can help with giving the skin a smooth, even and fresh appearance while targeting skin concerns such as fine lines and wrinkles, open pores, hyper pigmentation, melasma, discolouration, photo and chrono ageing, and acne scaring amongst many more concerns. It helps to stimulate the production of collagen and the growth of healthy skin cells for visible results. My skin is very oily but dehydrated too. I have quite visible open pores on my cheeks and I’m concerned about the early signs of ageing as I have some fine lines around my eyes. I’ve never suffered from acne but this summer, I used the Pixi Glow Tonic exfoliating toner which broke me out in really big, deep spots, in comparison to the little pimples that I get from time to time, and when they eventually went, I was left with marks on my cheeks where some of the bigger spots had been and they had a purple tint to them; I was properly using concealer for spots for the first time in my life! From the moment that I met Dr Giorgia Ratta, I was instantly impressed. She doesn’t believe in perfection or that it can be achieved, but close to it with treatments that enhance your natural beauty. I’m a big believer in being the best version of yourself that you can be so to find a cosmetic doctor who is on the same wavelength was really refreshing. My treatment began with a consultation and consent forms to fill in at the spacious and comfortable clinic on Harley Street. The consultation and forms were very thorough and I was able to ask any questions that I had regarding the treatment which really put my mind at rest. I wasn’t worried about the treatment or the Dr’s skills but the treatment was going to be a huge step up to anything that I’d tried in the past and stepping into the unknown made me nervous-excited! I should probably explain that my treatment was a little different to what others would experience if they were to book in to the clinic in that I was actually there for an event. While the private consultation, procedure and advice given was exactly the same as anyone else having the treatment done, I also had lots of eyes on me during the procedure as there were a number of people there to see the treatment in action. After lying on a bed, my skin was cleansed using the Sesderma Sensyses RX Cleanser to clean and degrease my skin and then the peel was applied. This was a 14% Ferulac Peel solution, chosen based on my skin type and concerns. The peel was unlike any I’ve had before. Every peel that I’ve had in the past has been less intense than the Sesderma, yet every peel at the very least has stung my skin. I remember having a pumpkin enzyme peel at a beauty salon a few years ago which was their lowest level of peel. It was so painful, I was gripping onto the sides of the bed for dear life. It was hot, itchy and stung like a thousand wasps. I wanted to pull at my skin to get it off and the worst part of it was that I didn’t feel any benefit. My skin looked exactly the same afterwards and I didn’t have a peeling effect! So you can imagine what I thought the Sesderma peel, being administered by a doctor, would be like. I was AMAZED. The Sesderma peel was 100% pain free. In fact, until the Doctor told me, I didn’t realise that I had it on as it felt like she’d just wiped a cool wet wipe across my face! I couldn’t believe it! The peel was removed and applied for a second time. It was obvious that my skin needed it as it began to peel almost immediately, as she was removing the peel for the second time. Little bits of my dead skin from the surface of my face were peeling away, completely pain free. This had a greater exfoliating effect than I’ve had in the past in a salon or at home. Aside from the benefit to the skin, the peel also serves the function of preparing the skin for the microneedling treatment. Following the peel and throughout the microneedling treatment, a lubricant was applied to my skin to ensure the Nanopore Stylus could glide effortlessly over my skin. This is the 3rd generation ten micro needle device used in the treatment. The needles themselves are tiny, at a depth of 0.25 to 1.5mm long which is smaller than other microneedling devices and he speed of the machine is able to be adjusted between 50 and 150 pulsations per second which is again, faster than other devices. The speed used is generally dependent on how sensitive the clients skin is as the more sensitive it is, the slower the setting should be used. However the faster the speed, the less pain is felt during the treatment. I believe mine was set to 0.5mm long and on 150 insertions per second. Now that may sound scary to some but it is a treatment that is virtually pain free so the skin doesn’t even require numbing before hand. The device is moved in lines across the skin for three minutes on each cheek and a minute and a half on the forehead and down the centre of the nose. The Nanopore Stylus doesn’t make a lot of noise and it has a low vibration level too, so while it isn’t designed to be a relaxing treatment, I did feel comfortable while having it done. Microneedling causes cellular proliferation destruction which is basically tiny little wounds in the skin. By causing mild trauma, the skin is forced to rejuvenate and repair itself; collagen and elastane fibres are stimulated to restructure, renew and plump the skin which heals it and leaves it looking far better than it did before. The Sesderma Nanopore Stylus is combined with Mesotherapy in this treatment. While the micro needles are being moved across the face, a serum that is packed full of active ingredients and mixed according to your skins needs, is applied to the skin and micro-needled into the micro channels that have been created in the skin. This enables the Meso solution and skin benefitting ingredients to penetrate deeper than they would ever be able to simply by applying the serum alone. The right hand side of my face was treated first and it didn’t hurt at all, it felt like more of a strong tickling sensation. The left had side of my face stung a little, the tickling sensation was stronger and felt more irritating but again, not painful. Apparently the forehead can be more sensitive as it is less fleshy but I didn’t experience any pain here. During the treatment, if the Nanopore Stylus would go around my eyes, nose or between my eyebrows then I would feel as though I wanted to sneeze or that my eyes were going to water. The movement of the microneedling device reminded me of when people have described having a tattoo done. A lot of people have said that it is like a constant scratching that starts to irritate you, as though you want to shoo the persons hand away and the description of that reminds me of how I felt about the microneedling. It was by no means as deep or painful as a tattoo but that constant tickling scratch does sound familiar. Many microneedling treatments are very painful and take around an hour to an hour and a half so they require numbing whereas the Sesderma treatment is, by comparison, very quick and not painful. It is over and done with in minutes and knowing just how short the treatment time is makes the time feel as though it is passing by even more quickly! The aim of the treatment isn’t to draw blood like some microneedling treatments. I remember seeing a photo of Kim Kardashian after she had experienced a treatment and she had speckles of blood all over her face; it was even rumoured that she had had extra sprayed onto her face to increase the appearance of the blood and the effects of the microneedling which in all honesty, I think is ridiculous. The treatment that I had didn’t draw any blood except for a tiny little pin prick drop on the side of one of my nostrils. Once the treatment was over, a post peel and treatment serum and SPF 50 was applied to my skin. The serum really stung and my face felt warm but this gradually decreased minute by minute. Applying SPF 50 with UVA and UVB protection is essential as the skin is incredibly very sensitive following the treatment. Daily application of sunscreen is very important for a good week following the treatment however I wear an SPF everyday anyway to protect my skin from sun damage and to help my skin to remain youthful. Immediately after the treatment, I was amazed at how light my skin was. I had expected it to be red raw but it was just a little bit red and this decreased really quickly as you can see by the comparison of the photos above when I had literally just got up off the bed compared to the photo I had taken further up with Dr G which was about 45 minutes following the procedure; its pretty amazing considering the intensity of the treatment. My face felt quite warm but cooled down more and more each minute which I was really impressed with. After my treatment, I went out to dinner with my friends and didn’t feel self conscious of my skin. My face was shiny because of the products applied after the treatment but it wasn’t very noticeable and I’m really confident without makeup anyway. About 4 hours later when I was on the train home, I felt as though my face was heating up again and when I looked at myself on my phone screen, my face had become very red which stood out more against my lily white neck. Its really important to not touch the skin in the hours following the treatment so as not to transfer any dirt or bacteria to the skin but I could tell when opening my mouth that my skin felt tender and a sort of bearable burning sensation. I think that this is to be expected really and if someone were living closer to London than me, who has to get a train from Newcastle, I think they would be able to have the treatment and get home before experiencing the redness. I went straight to sleep when I got back without putting anything additionally on my face. Day 1- The morning after my treatment, I woke up to find that the redness of my skin had greatly decreased and my face was just a little bit pink. I didn’t have any peeling. I had been give a pack of Sesderma Hidraven Wipes which I used to wipe over my face to clean my skin. I used these everyday until I had used them up following the treatment as I knew that they worked hand in hand with the other Sesderma sample sachets that I had been given and I was worried that any of my usual skincare products would irritate my skin for the first couple of days as I had been advised to avoid harsh or perfumed products etc. When using the wipes, my skin felt a little sore and after I applied one of the sachets of serum, my skin stung a little and became a little more red. Once the serum had settled into my skin, I applied the Sesderma SPF 50 which is very thick and white. It smoothed onto my skin, felt instantly cooling and took the redness right down, once again, to a pink tint. I had a personal training session that morning and didn’t feel self conscious when out and about; no one noticed or looked at me funny. My PT knew I’d had the treatment done as I’d asked for a very gentle training session and my skin wasn’t irritated at all during my exercise. On the afternoon, I had a couple of meetings with two of my clients for work and again, my skin looked a little pink but nothing major. I noticed that as the day progressed, my skin started to look a bit more tanned than pink, as though I had been sunbathing the day before. By the evening, my skin felt tight and I used the wipes again before applying lots of serum and moisturiser to hydrate my skin. They stung when first applied, presumably as my skin was still tender, then settled within a minute. To save repeating myself, I cleansed and applied my serum and moisturiser morning and night (with SPF every AM) to my skin each day. Day 2- By the second morning following the treatment, my skin had drank up all of the nourishing products from the night before and felt very dry and tight again. I had developed a little bit of peeling next to my nose and a little on my chin which was so tempting to pick off but I refrained! My skin didn’t look sore, just lightly tanned. There was a contrast between my neck, where I hadn’t had the treatment, and my face but it didn’t look too noticeable. That night, I was going out out in Newcastle to celebrate my birthday and I wanted to wear makeup and get all dressed up. When I had my shower, I used a damp flannel and gently moved it over my skin, to lightly exfoliate my skin and lots of little bits of skin were peeling off with it. When I got out of the shower, I applied my moisturiser and my face did sting as it was only a couple of days after my treatment and my skin was still sensitive. Wearing makeup on day 2, beautiful result on my skin, despite the peeling! Applying makeup was an absolutely nightmare and if I can offer one piece of advice, that would be to not attempt to use liquid foundation. The more that I was buffing it in, the more skin that was peeling away and I ended up with a big circle in the middle of my forehead where the skin had peeled away. In the end, I put some foundation on my Beauty Blender and kind of pressed the foundation followed by my powder onto my skin and this worked better. Through the night you could see little bits of skin where they were flaking but it wasn’t anything major. I removed my makeup using a micellar water on a cotton pad and then a cream cleanser with flannel but very, very gently. I used the Sesderma wipes afterwards too. The wipes are sold online as makeup removal towelettes but I think that they’re a little too astringent for makeup removal and you couldn’t use them anywhere near your eyes. Day 3- The third day was when I felt as though I experienced the most peeling but I also felt as though there was a big difference in how tender my skin felt as compared to the day before, it didn’t sting at all when applying my skincare. My skin was still a little tender but nothing close to being sore. When I went in the shower, I exfoliated my skin using my favourite face scrub of all time, the Goldfaden MD Doctors Scrub, and it didn’t hurt at all. This was to encourage the rest of the dead skin to come away and it really worked. Since my skin was peeling, I really focused on hydrating my skin using the rest of the Sesderma sample sachets that I had been given. Day 4- By the fourth day, my skin had virtually stopped peeling. I just had a tiny little bit down the sides of my face and it wasn’t noticeable. In fact, none of the peeling that I had experienced throughout this process had been particularly obvious. My skin had gone down in colour and just had an ever so slight hint of tan. My skin wasn’t tender to the touch whatsoever by day four and I couldn’t get over how smooth my skin looked. As vain as it sounds, I couldn’t stop looking in the mirror! I started to use my own skincare products by this point and found they didn’t irritate my skin at all. My skin still felt dry and a little tight so hydration and nourishment was key within my routine. It felt so strange to have dry skin as I’ve lived with oily skin my whole life! Day 5- On the fifth day, I didn’t have any peeling whatsoever, my skin didn’t feel tight but it did feel a little dry. The colour of my skin had returned to almost normal and it felt and looked smoother than it ever had done before. 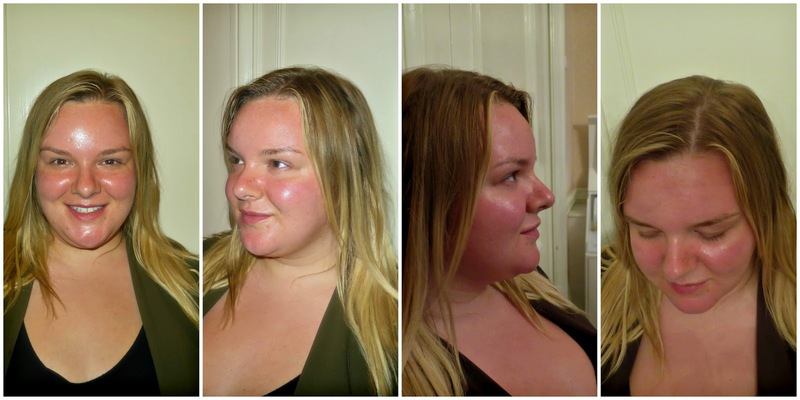 The pores on my cheeks around my nose appeared smaller and overall, my skin looked refined and bright. I started to receive so many compliments on how great my skin looked when I was out and I was telling everyone who would listen about how amazing this treatment is. Day 6- When I applied my makeup on day 6, I was absolutely gobsmacked. Since my skin had felt very dry on day 2, I applied the only none mattifying foundation that I had and thought that it seemed to last longer than it usually would but I didn’t pay too much attention to it. Then when I’d had a similar experience but with a powder foundation on day four, I was intrigued. So on day 6, I applied the Too Faced Born This Way Foundation. I had been given this when it very first came out but I couldn’t get more than an hour out of my foundation before the oily would start to break through and the foundation would slip from my skin, looking unsightly. I was gutted as the finish, etc was beautiful and it didn’t matter what powder or primer I used underneath, it just wouldn’t stay on my skin. The foundation applied flawlessly to my skin and lasted ALL DAY without sliding off. For someone who has really suffered with oily skin, this was a miracle. Day 7- By day seven, you would think my skin had been kissed by angels. It looked perfect and there was no signs that I’d had the peel or the microneedling at all, everything had returned to normal but 100 times better. Week 2- Throughout week two, the smooth surface and reduced pore appearance remained. Plus, the scarring that I had left over from my Pixi Glow Tonic induced spots had completely gone! My skin looked healthy and glowing and I continued to use the Too Faced foundation without any oily skin issues. It was as though my skin had been reset and balanced. It wasn’t dry but it wasn’t on the mega oily side either, it had become more normal to oily. I also started to notice that I was getting tiny little white head blemishes. Not loads, just the odd one here and there and all I would do is gently remove it with tissues on my fingers and then pop on my witch spot stick and the area would heel very quickly overnight. It kind of felt as though my skin was that clean and that renewed that it was so much better at getting rid of impurities than before. Whereas prior to the treatment, I had lots of blackheads and would get the odd spot that would hang around for a good few days, it felt as though after the treatment, my skin didn’t want to hold onto any dirt like that. So I would get a little white pimple rather than that dirt getting trapped and settling into my skin or coming up from deep within my skin and being there for a while before breaking through, it would just be on the surface of my skin really lightly and I would wipe it away without really breaking my skin and pulling it. I hope that makes some sense, I’m not sure if there’s any dermatological theory behind it but thats how it felt! Wearing less face makeup than usual in my Paul and Joe makeup post. Week 3- My Too Faced Foundation had become my go-to and it was all that I was wearing. I found that I could still wear my other mattifying foundations but they would make my skin look really matte so I would reserve them for long makeup wearing days. My skin still looked virtually flawless and some days I would go out wearing only mascara and receive compliments on how great my skin looked. When I was wearing makeup, I was wearing far less on my face than I usually would. The above photo is a great example of this. It isn’t edited, I’m just sat away from a harsh studio light and the photo was taken on a great camera that, unfortunately, picks up every flaw… which just shows how great my skin was looking when it was taken! My skin was still really smoothed in appearance, especially around my eyes which is the area that I’m most concerned about showing ageing. The tone of my skin was very even too. This week was when the temperature outside seemed to really drop and I’ve had the heating on at home more or less ever since. I switched up my skincare routine and added an oil in there. I found that my products were sinking into my skin more quickly and working more effectively. Week 4- My skin was still looking on fleek as the kids say and I really feel as though the treatment has had a lasting impact on my skin; most obviously by the way that my foundation was lasting and I was really getting the most out of my skincare products. Week 5- By week five, I started to notice that while my skin was still looking great, it was starting to look more dehydrated so I really had to up the amount of hydrating products that I was using, it was as though my skin couldn’t get enough of the moisture. The little pimples that I was getting had stopped and I felt as though I had adapted my skincare routine to suit my now normal to oily face. I was still loving the way that my skin looked without makeup and with makeup, well, it looked flawless. I’ve had so many compliments on my complexion, including from makeup artists when I’ve met with brands and the kind words definitely make me smile. If you have a look at my Instagram, you’ll be able to see what my skin looks like with makeup on as I don’t really use filters or edit my selfie photos. 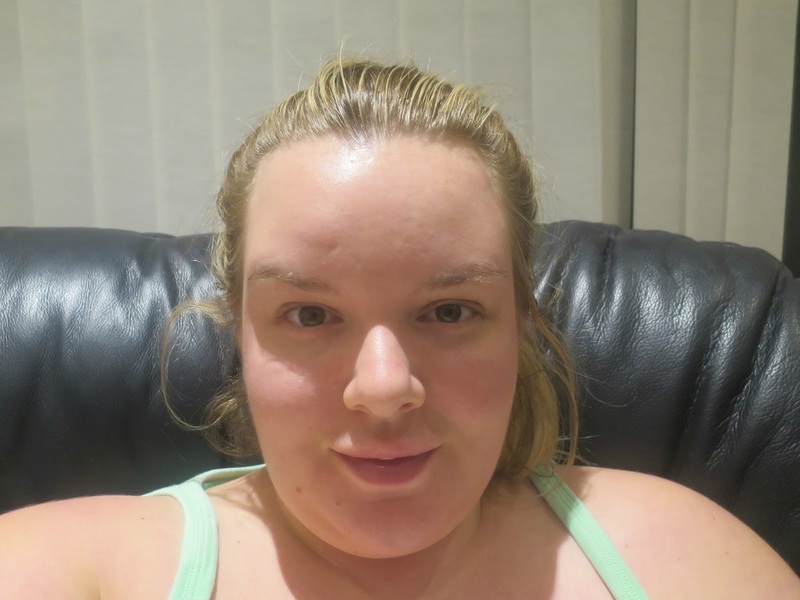 Week 6- I’m now at week six point since my treatment and I’m still loving the results. However I do feel as though I have reached a plateau now and I could benefit from an another treatment. I’m absolutely exhausted at the moment because I’m burning the candle at both ends and working far too much and I do think that this is showing in my skin. I loved how refined my skin was after the treatment and how long that lasted for so I think having another peel especially would be beneficial for me. It is recommended that a client have up to six treatments, generally as part of a course. My skin wasn’t too bad aesthetically before I had the treatment but the benefits I have experienced from having it done have amazed me more than I ever thought they would; especially my oily skin being normalised and my foundation lasting longer. Its funny because if I’d reviewed the treatment after say 3 or 4 weeks, I’d have said that one treatment was more than enough but after the 6 week mark, I do think that I would benefit from another. Especially knowing how balanced it has made my skin compared to how oily it was before; I never want to lose that feeling! The above photo was taken exactly six weeks from having the treatment. I’m looking a little flushed as I’d been rushing around in the house and I’d had very little sleep but yet I still think that my skin looks good. It is clear, quite even despite being flushed and still smooth, not as much as in previous weeks but still better than before I had the treatment. The Sesderma peel and microneedling treatment is by no means cheap at £180 for a single session or a course of 6 sessions for £900 with free post treatment products to use at home. However when I think about the amount of times I’ve spent £40, £60, £80 on facials in spas and beauty salons and never had the results that I’ve had with this treatment, it is completely worth it. Back in February, I went to a local spa hotel and paid £80 for a facial which was the usual, cleanse, tone, exfoliate, mask and moisturise but essentially I was paying for a lady to massage cream into my face using products that I have similar to at home. I felt relaxed afterwards but there was no real physical, lasting benefit to my skin. Whereas this treatment has made a significant difference to my skin and I would not hesitate to book in again when I’m next in London. I think that if you work in an office or need to go out to work, then the best day to have this facial on would be either a Wednesday like I did or a Thursday. That’s because the majority of the peeling doesn’t start (or at least it didn’t on me) until two days after the treatment which would take you into the weekend and then by the Monday, I was able to wear makeup again without all of the peeling and the redness had virtually gone. If you do wear makeup, use mineral or powder makeup as a base for the first 5 days; I’d recommend picking up this Bare Minerals kit as its affordable and high performing. The downtime is far less than other treatments and yet I’ve seen more benefits with Sesderma than I have with any other microneedling facial or skin peel that I’ve had in the past and it is 100% worth it. To have a virtually pain free treatment that has such an impact with such a quick recovery time is amazing. I’d highly recommend booking in to have this treatment, especially if you’re living in the London area or if you travel there for work like I do. I’ve really thoroughly tested out the treatment and given it time to be able to see the full effects and how long they last. It would be irresponsible of me not to do so, especially given the cost. Until the end of December 2016, there is a SPECIAL 20% OFF OFFER on this treatment; get it for £720 for 6 sessions. 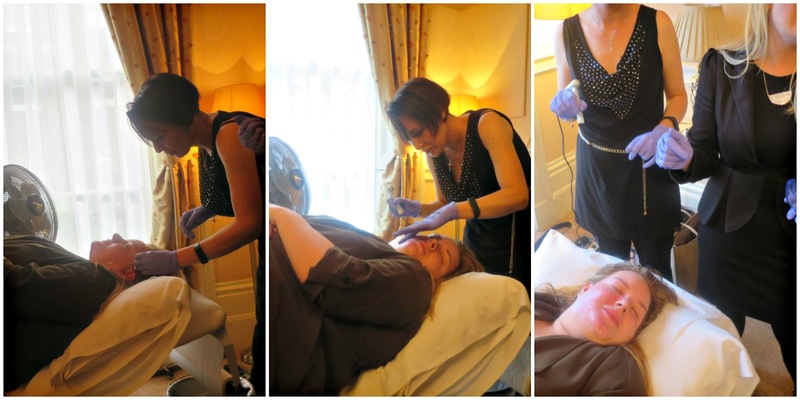 Dr Giorgia Ratta’s Cosmetic Clinic is based on 10 Harley Street, London, W1G 9PF. Evening appointments are available to suit your lifestyle too! If you’d like to book in or find out more, please email info@drgiorgiaratta.com. You can follow the practice on Facebook, Twitter and Instagram and you can visit the website here. If you want younger looking skin, to fade scarring or to improve the appearance of your skin then this is the treatment for you! Thanks so much to Dr Giorgia Ratta for introducing me to such a fantastic treatment that has given me so much happiness with my previously VERY oily skin. I’ll certainly be booking in myself back in to help my skin even more! This procedure has improved your skin. I think your skin is not that very sensitive because you were still able to put makeup when you were peeling. If I had done this and put makeup, it would just highlight those dry areas. You did a good job in applying makeup so it was okay. Oh wow, it looks like a great treatment. My skin so needs this! Wow your skin looks incredible and great news that 6 weeks after you are still feeling great. I have never heard of this treatment but its great to read about it in so much detail. Wow that sounds fantastic and it's great that it was pain free too! 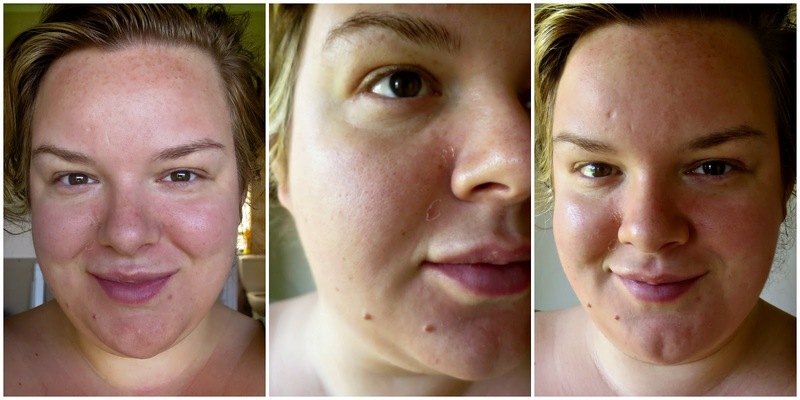 I've been tempted by peels in the past but I'm sold on the idea now – your skin looks amazing! Wow these before and after shots are incredible! Looks like it does a really great job and your skin is definitely looking more youthful! Oh wow, that looks like such an incredible resurfacing treatment. My skin is quite simply awful after 4 pregnancies and I wish I had the guts and the budget to go through with a peel like this.